Jewish friends: don’t vote for Obama! Most of my Jewish friends plan to vote for Barack Obama. This is because they simply cannot bring themselves to betray their long-term ideological commitment to ‘liberal’ principles of fairness, caring for the disadvantaged, reducing income inequality, etc., believing that a Republican represents the opposite of these things. Even though many of them are affluent and very few of them are what one might call ‘workers’, they believe that Obama stands for the little guy and Mitt Romney for Wall Street and viciously amoral corporations. They have heard that Obama is anti-Israel, but the President and his surrogates have gone to great length to argue that the opposite is true, and that my friends are hearing Republican propaganda. Because they want to support Obama for other reasons, they want to believe this. Some of them, truth be told, don’t think much about Israel and don’t know very much about it. What they often hear from their Reform rabbis or read in the Forward is that Israel is really not so democratic and behaves immorally toward the Palestinians. Anyway, they believe that Israel is a mighty military power which has existed for as long as they remember, and is in little danger. To a great extent, my friends are wrong about all of these things. But Obama (finally) came out for gay marriage and tried to solve the ongoing healthcare train-wreck, they tell me, knowing that I share their liberal views on these issues. The reality is that the President’s personal feelings about marriage are irrelevant. He does not have the power to overthrow the federal Defense of Marriage Act or California’s Proposition 8. That will be done (or not) by the sitting Supreme Court. And it will be up to individual state legislatures to permit (or not) gay marriage in their states. Healthcare? Don’t make me laugh. Obama’s great ‘success’ was to get a bill passed that included a few small reforms but tiptoed around the great vested interests of the insurance and drug companies. Yes, it was opposed by Republicans. Maybe if it had promised a true revolutionary change in our broken healthcare system, it would have gotten enough enthusiastic popular support to swamp the opposition. Wall Street? Obama is tight with the bankers and they are among his biggest contributors. Did he inherit the financial mess? Yes. Does he appear to have a clue about how to solve it? No. There are some other very disturbing things about the President and his administration. This is the administration that expunged the words jihad and Muslim from FBI training materials and references to Jerusalem being in Israel from official websites, and the president that compared the Holocaust to the “Palestinian quest for a homeland.” Sometimes he “misspeaks” in ways that are bizarre, as his recent gaffe about “Polish death camps” illustrates. Unlike gay marriage, in foreign affairs the President is by far the most powerful determinant of US policy. And here is where my Jewish friends should be the most wary, if they retain even a little feeling about the Jewish state. Israel’s existence is not guaranteed. Probably a majority of the inhabitants of the earth would answer ‘no’ if they were asked whether there should be a Jewish state of Israel. Israel’s small size makes it vulnerable despite its military capability. I think it is probably correct that if Iran obtains nuclear weapons, Israel’s chance of survival for another 10 years will be less than 50% (whether or not the nukes are used against it). Don’t kid yourself. If Israel’s enemies succeed, hundreds of thousands, perhaps millions, of Jews will die and the others will scatter throughout the world in a third Diaspora. That is what is at stake. 1. Obama says he likes Israel. That’s nice but so what? Of course it is good when he says nice things (by coincidence, no doubt, usually to Jewish audiences) but one can also find a lot of nasty remarks by him, his advisors, and various officials appointed by him. Every president for the last half-century has said similar nice things; not all the presidents put together during this period have said or done so many hostile things. While it is a great exaggeration to say that Obama hates Israel or wants to destroy it, I think it is fair to say that no president (including Jimmy Carter when in office) has been so cold toward Israel and basically failed to understand its nature and interests. 2. Israeli leaders say Obama is great. Yes, that’s nice but it’s not what they say in private. I can tell you authoritatively that not a single Israeli leader in any party has a high opinion of Obama with regard to Israel and its interests. But it is their job to lavish praise on America’s president. Their task is not to defeat Obama or to critique him but to get along with him as well as possible in order to protect Israel’s long-term alliance with the United States without sacrificing any of Israel’s vital interests. They’ve done it well. The one moment the truth emerged was when Obama betrayed Israel, on the diplomatic level, by announcing, without consultation, a new policy on peace terms while Prime Minister Benjamin Netanyahu was flying to Washington. You think Israeli leaders (and this is not ideological, not a matter of left or right) have a high regard for Obama? Read Netanyahu’s speech to the joint session of Congress. Perhaps the equation can be summarized as follows: Obama just gave Israeli President Shimon Peres a presidential medal of freedom. He also has just helped give Israel a second Muslim Brotherhood-dominated regime next door and insists that this is a good thing. That’s true but only a small part of that relates to Obama’s benevolence. Why? c. Regarding military relations, the U.S. armed forces are generally quite pro-Israel and want these programs. Many of them are based on previous commitments which Obama merely continues. An especially important reason why Obama’s Administration hasn’t been far more hostile to Israel in practice is that the Arabs and Iran shafted it. Remember that Obama offered to support the Palestinians, pressure Israel, and accelerate talks if only the Arab states and Palestinian Authority showed some flexibility. They repeatedly rejected his efforts—refusing even to talk–giving him no opportunity or incentive to press Israel for concessions. Note, too, though, that the repeated humiliations handed him by the Arabs never made him criticize them publicly, change his general line, or back Israel more enthusiastically. -Only after a long delay. -Did less than Congress wanted. -Exempted in effect China, Russia, and Turkey from observing the sanctions. Obama has been visibly eager to make a deal with Tehran, even on bad terms. Only Iran’s hard line has prevented some kind of arrangement that favored Iran. Instead, though, Tehran has used Obama’s slowness and desire for some compromise in order to buy time for its nuclear program to progress. –Soft line toward antisemitic, anti-Israel, and also anti-American Islamism. –Support for overturning the Mubarak regime and encouragement for a Muslim Brotherhood takeover there. 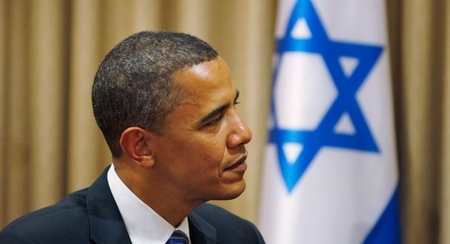 During the 2011 crisis, Obama never even consulted Israel. The outspoken antisemitism, calls for genocide against Israel’s citizens, and support for anti-Israel terrorism by the Muslim Brotherhood have had no effect on Obama’s policy and brought no criticism by the U.S. government of that movement. This point must be underlined. Do not forget for one moment that the Brotherhood is an explicitly antisemitic movement that calls for genocide against Jews in and often outside of Israel. It has never to the tiniest degree criticized or repented for its strong support for Nazi Germany. It is in fact that most important antisemitic movement in the world today. Anyone who claims that this movement is in fact moderate, denying its antisemitism and genocidal intentions, and helps it to achieve power is acting profoundly against the interests of Israel and of the Jewish people. Period. –His soft line toward Hizballah in Lebanon, including breaking promises made to Israel to keep terrorists out of south Lebanon. –Pressure on Israel to reduce sanctions on the Hamas regime in the Gaza Strip greatly empowered that radical antisemitic movement. –The Obama Administration has been passive about the Fatah-Hamas merger and has virtually never criticized or pressured the Palestinin Authority. –By distancing himself from Israel (something that everyone in the world knows except about 60 percent of American Jews) he has encouraged Israel’s enemies to be bolder and bystanders to themselves move away from Israel. –One of his worst actions has been to come close to worshipping Turkey’s Islamist regime despite its tremendous hostility toward Israel. Obama’s passivity has helped turn the Turkish-Israel alliance into something verging on cold war. Since the Turkish regime continues to be rewarded by Obama despite doing things like getting Israel barred from the NATO meeting and indicting Israeli officers over the Gaza flotilla confrontation, Ankara has no incentive to stop or reduce its enmity. –In Syria he has supported the installation of an Islamist leadership for the opposition movement, posing a tremendous potential future danger for Israel. –Regarding Iran, Obama was very slow to take up the battle against the nuclear weapons campaign. Despite the relatively high level of sanctions (for which Congress deserves a lot of the credit) one can well doubt his future determination to battle Tehran. He also failed to support the Iranian opposition. –And by weakening American credibility and alliances, Obama has undermined the U.S. ability to protect its own interests which, in turn, hurts Israel’s security. There’s a lot more and each of the factors above can be amplified with lots of examples and documentation. All of this far overwhelms the very short “pro-Obama” list. Did I mention that during a second term he won’t need to worry about fundraising or running for election again? This entry was posted on Friday, June 1st, 2012 at 1:41 pm and is filed under General. You can follow any responses to this entry through the RSS 2.0 feed. Both comments and pings are currently closed. I can appreciate having Jewish friends with diverse views, but I cannot for the life of me imagine having friends period, let alone Jewish friends, thick and/or naive enough to fail to see Obama for anything other than what he is. I must be getting old and cranky, but any Jew who supports Obama cannot/will not be considered a friend of mine……Israel is too important to me. Maybe living there for twenty years, being still active in reserves, and having nine grandkids there has something to do with it…..or maybe I just recognize him for the dangerous anti-Semitic, anti-American schmuck that he is. Keep up the great work you do Vic. The several generations worth of political/cultural inertia that keeps most Jewish Americans in the knee-jerk Democratic camp is hard to reverse. However, it is changing. – It has only bounced back because, as one might notice, since that time, Obama has backed off from giving Israel a lot of grief, at least publicly. His apparachiks in the media have followed suit and Israel is largely out of the news of late. This is not to say that Obama’s actual positions towards Israel have changed one iota – they haven’t, rest assured – but not being reminded of them, many Jews are deluding themselves into ’08-style denial about his hostility towards Israel. – Even with 62%, that would be the lowest level of Jewish support for any Democratic presidential candidate since the end of WW2. And, I’ve heard anecdotally that Jewish fundraising for Obama is WAY down from ’08 levels. One Jewish vote for Obama is still too many – heck, one vote for him from ANYBODY is too many – but things are trending in the right direction. The key for us now is to REMIND our fellow Jews who care about Israel – and I would submit that is most Jews, whether they are willing to admit that to pollsters or not – how bad Obama really is for Israel. And for Jews who don’t make the connection, they need to be educated as to why this matters for them, even if they don’t live there. Vic, you are doing terrific work towards both ends. Yes, keep it up. We all have to keep it up. This isn’t just up to Vic…. The last part of this analysis is , in my opinion, correct. Liberal commentators see Obama as a great foreign policy success. I see him as an almost complete failure. The fiasco with Egypt began with his speech there , but its major turning point was his dropping Mubarak, and betting on the Egyptian shabab. He has the Muslim Brotherhood now and he seems not to mind. But they are at heart anti- American and no- good is coming from all of this. I will not go down the long list of errors. Nor will I go over his mistaken ploy at the outset with the whole settlement freeze business, his rudeness and coldness to Prime Minister Netanyahu, his failure to call Jihadis Jihadis. There is in short a convincing case for any supporter of Israel to vote against him. But for fairness sake it should be said that Obama has supported Israel at the U.N. and ordered an intensification of Defense cooperation at least in some areas. He has made the policy of preventing Iran from attaining nuclear weapons his own policy, and not just Israel’s. This is an important achievement for Prime Minister Netanyahu. I would not vote for him if I still voted in U.S. elections but a fair overall picture of his record would show that he has not abandoned Israel as many of his fiercest critics claimed he would.